Aglo Systems is now offering a new LED technology, transforming your floor into a tool to interact with your guests and customers creating an inviting environment. With one simple installation, make your visitors feel welcome. With one simple installation, make your visitors feel welcome, your floor inspiring and create a lasting impression. The luminous carpets can be used to enhance your brand and inform people with moving interactive messages and images in one touch of your phone or tablet. These elegant carpets are the perfect combination between high-end quality and cutting-edge LED lights. This solution has been created to fit into any building architecture, without interrupting the normal daily processes, like cleaning. This solution combines high-quality stylish carpets with cutting-edge LED’s built into strong super thin LED panels, using the latest technology. With little guidance, the luminous carpets are installed and connected to your electrical and IT infrastructure. The patented LED panels are installed underneath the light transmissive carpet tiles which can withstand continuous foot traffic. 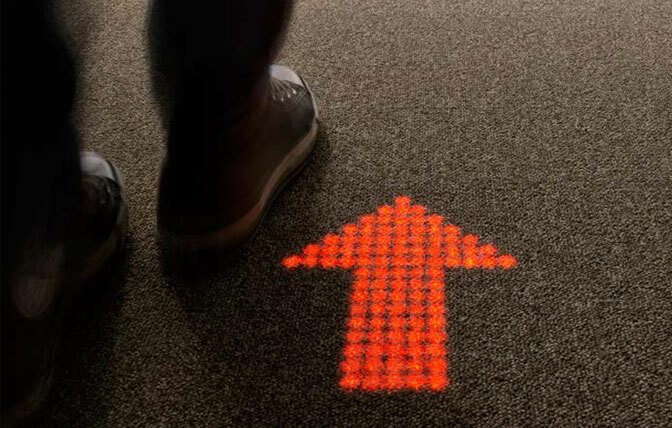 Contact sales@aglosystems.com.au or call 1300 601 931 for more information on luminous carpets.